Tom Doniphon shoots the outlaw thug Liberty Valance from the shadows, keeps it a secret, then realizes that his girl Hallie is in love with Ransom Stoddard, whereupon he burns his house to the ground (starting with the new wing he’d built for her. When Stoddard is wracked with guilt thinking he killed Valance, Doniphon relieves his conscience, leaving him free to pursue his political career, founded on his false heroism. Does this make sense? Setting aside the question of why Stoddard thinks it’s morally acceptable to base his career on a lie, but not on the real killing (he’d rather have people think he killed Valance than actually do it), rewatching the film this most recent time it’s Doniphon that fascinates me. His tragedy is his unwillingness to act. He’s the toughest man in town, admired by all, the only one brave enough, strong enough, fast enough to stand up to Valance, except he won’t do it. Everyone similarly assumes he and Hallie will get married, but he never asks her. He’s even elected as a delegate to the territorial convention but refuses to serve. Despite his many abilities, he simply will not take part in the community. Even his house is far outside the town (whereas Stoddard lives in its heart: at the restaurant and newspaper office). Why does Doniphon hesitate? In all other respects, he’s the same character John Wayne played in countless films throughout his career, the competent hero, cool under fire, respected by all. It would be easy for him to assume the title of town marshal from lovable cowardly drunk Andy Devine, and yet he has no interest. He’s the individualistic strain in American history: the isolationist, the Randian, the pioneer who wants not to build a community, but his own private empire. But he’s conflicted: he finds himself drawn back to the community time and again, ostensibly by his love for Hattie, but also from an honest desire to help the townspeople avoid being killed by Valance and other instruments of the “Northern cattle interests” that are attempting to block statehood, and thus the establishment of law and order in the territory (statehood means the end of the so-called ‘open range’ the literal and symbolic manifestation of the raw capitalist power of the cattle barons: the land belongs to them because they have the power to take it). His sympathy for the townspeople is real, but not enough to motivate him to take action on their behalf. 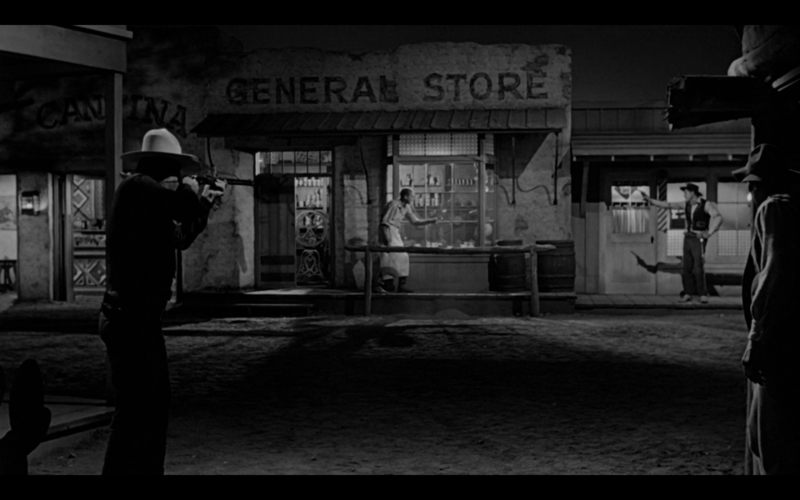 So why then does he shoot Liberty Valance? And more importantly, why does he do it in secret? Supposedly he likes Stoddard and doesn’t want to see him killed, but what prevents him from announcing his presence before hand, or even after? Why does this man, who has no trouble dominating a political meeting while simultaneously refusing to participate in it, skulk in the shadows like a thief, a coward? Is it that the Randian half of him is ashamed of his altruistic impulses? Seeing how his act of heroism has won Hattie for Stoddard, he becomes disgusted with himself, burning his home, the symbol of his hopes for the future as well as his isolation from the community, to the ground. In a final act of self-negation, he tells Stoddard the truth, absolving him of the act of killing (to which Stoddard had remained steadfastly opposed throughout his ordeal in the West), and taking the sin on himself to suffer alone. That Stoddard, thus relieved of the sin of murder has no problem committing the sin of dishonesty says as much about the nature of politicians as it does his own character. But what if Doniphon is lying, what if Stoddard really is the man who shot Liberty Valance? In this scenario, Doniphon is not simply a radical individualist who refuses to partake in community out of a twisted kind of idealism, rather he’s simply a coward. Sure, he talks a big game, and he certainly has a certain degree of martial prowess, but he refuses to put it to use, perhaps for fear of failure. This is why he can make a scene at the town meeting, mocking the participants and the rules (“the Law says the bar is closed!”) while turning down appointment to the delegation: if appointed, he might embarrass himself, perhaps showing himself to be ignorant of the rules or other social expectations. Much safer to hide behind sarcasm and mockery. Stoddard has none of this embarrassment. He has no fear about standing up for what he believes is right, regardless of his physical inability to defend it or himself. Stoddard thus fascinates and shames Doniphon. He is everything Doniphon wishes he could be. And so, when Doniphon sees that Stoddard killed Valance, and thus won the heart of the girl Doniphon was too afraid to propose too, he shatters in self-disgust. He knows that his cowardice has lost him his chance at happiness. But still he admires Stoddard immensely. He goes to the convention and sees Stoddard break down and try to flee rather than stand for election. Recognizing that that kind of cowardice is his own and not Stoddard’s, he gives him a pep talk and tells him what he wants to hear: that he did not violate his belief in non-violence, that he is the man he always thought he was. Thus buoyed, Stoddard rushes off to become the heroic figure that will dominate the politics of the territory, and then state, for decades to come. Either way, the film ends with the question of whether Doniphon’s nature is individualistic or cowardly (or whether there’s really any difference between the two) deemed irrelevant. 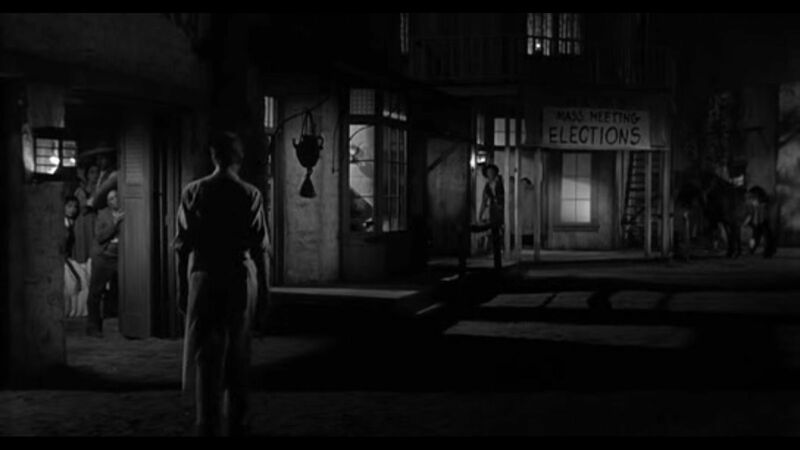 As is the question of who really killed Liberty Valance. It’s not just a matter of “printing the legend”: it really makes no difference. Either way, Doniphon destroys of himself in favor of Stoddard’s elevation, and America is built on a lie.